Bali Rafting, ATV Ride and Horse Riding Tour is an Bali Triple Activities Tour Packages we created to make your holiday more enjoyable by Riding ATV Bike for 2 hours, Ayung River Rafting Adventure for 2 hours, and then the last do 1 Hours 30 Minutes horseback riding tour packages in Bali islands. First adventure you will try is ride the ATV bike with duration 2 hours and assist by professional ATV guide you will explore the beauty of nature panorama and try to beat the challenge we made. 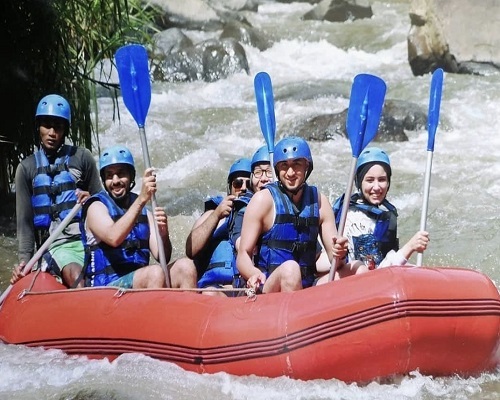 Then enjoy the most famous adventure in Bali by allowed you to try the rapids challenge at Ayung River by doing the white water rafting adventure. You will try this rafting adventure around 2 hours and then you will enjoy lunch buffet Indonesian food. During the rafting you also can see the amazing scenery in the river swim at river. After finish your lunch at rafting we will continue the tour to enjoy the horseback riding around 1 hours 30 minutes through village and Serangan beach with amazing horseback riding guide. This Bali Rafting, ATV Ride and Horse Riding Tour Packages more enjoyable with our professional English Speaking Driver by give the maximum Bali Tour Services to make this trip memorable one.